My paintings are large stages for peak experiences, peopled by figures representing friends, family, and mirror images of myself. Some of these characters actively respond in the dramatic moment, and some are unaware of the commotion around them. This series of paintings, Parachute Suite, reflects on the variety of reactions we experience in moments of crisis. The central action is a skydiver crash-landing in a backyard. The results play through multiple paintings, echoing the visual cycles in Baroque religious painting. 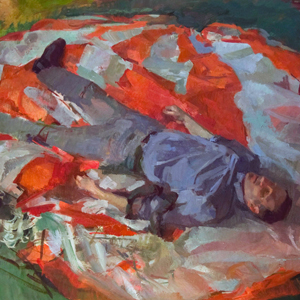 One large painting focuses on the climactic backyard crash, and another shows a deposition scene, where the parachute is gathered and bundled up. The identity and fate of the skydiver is left ambiguous, extending that tenuous moment of uncertainty that accompanies any crisis and leaving space for the viewer to intuit the outcome. I paint from direct observation, making extensive use of figure models and working on location outdoors. These paintings coalesce over months and sometimes years of work. I live with the paintings in my imagination for so long, it seems unavoidable that elements of autobiography insinuate themselves into the fabric of the scene.